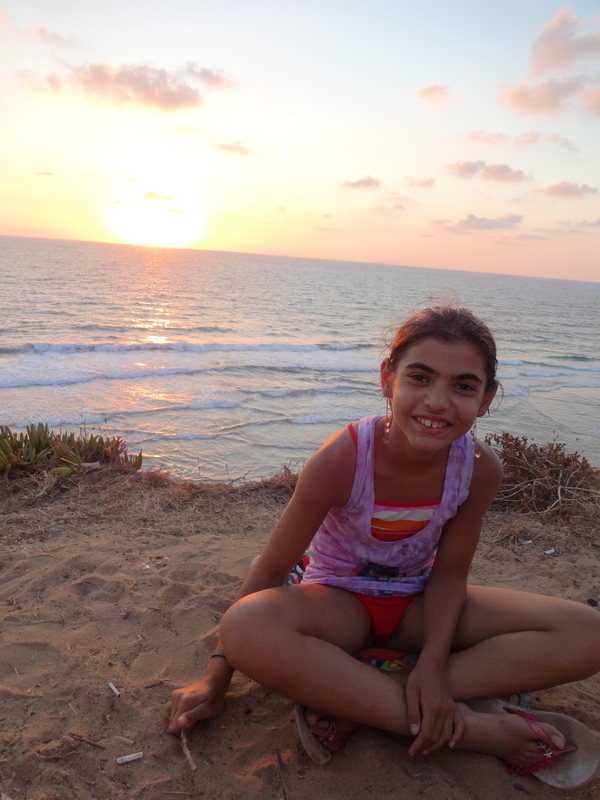 Last month we traveled to Israel with our friends John and Kelsie. 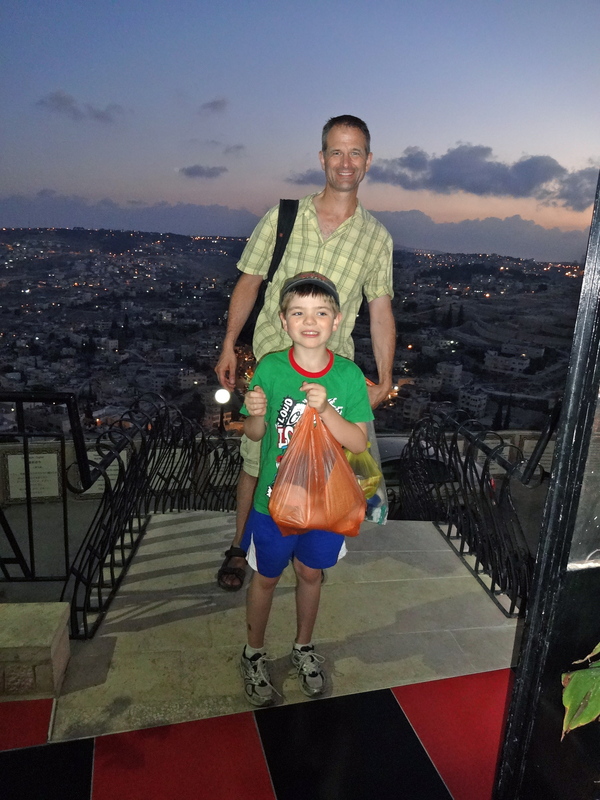 We spent four wonderful days in Jerusalem. It is the most fascinating city…there’s no where else like it in the world! 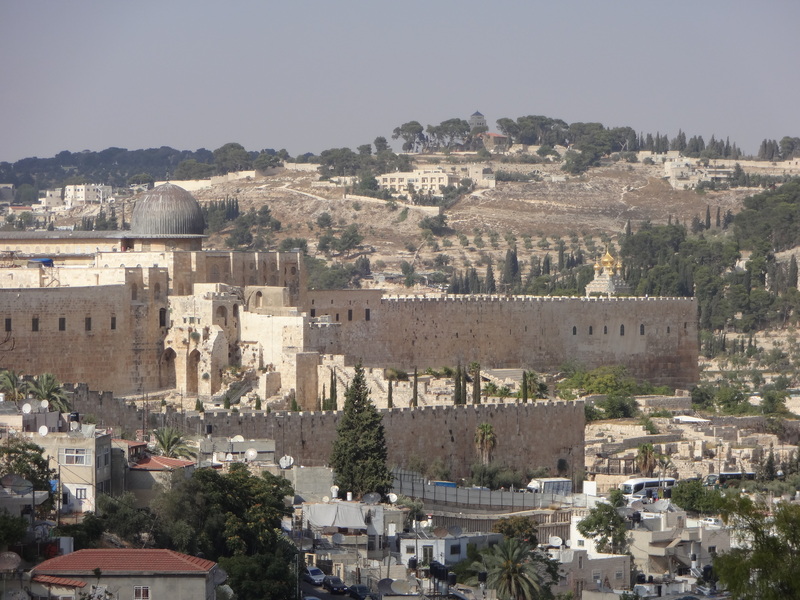 Jerusalem is the site of many important biblical events. 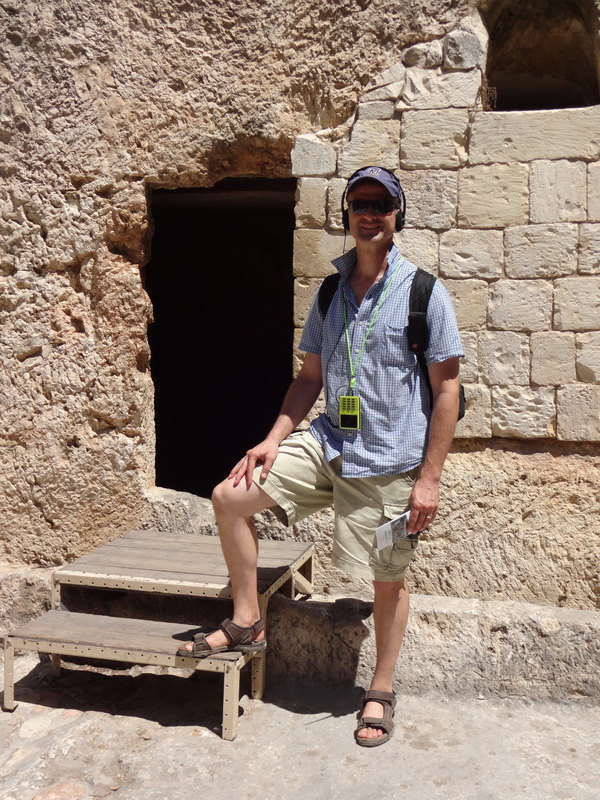 Since I am a Christian, it was an amazing experience to see the Bible come alive…especially the Passion of Christ. Jesus was a controversial figure then, as he still is today. In his day, he inspired great devotion as well as great anger. The following photos tell the story of Jesus’ last few days before he was crucified. Things have changed a lot in the last 2000 years! Jesus celebrated the Passover (the Last Supper) with his disciples in Jerusalem. 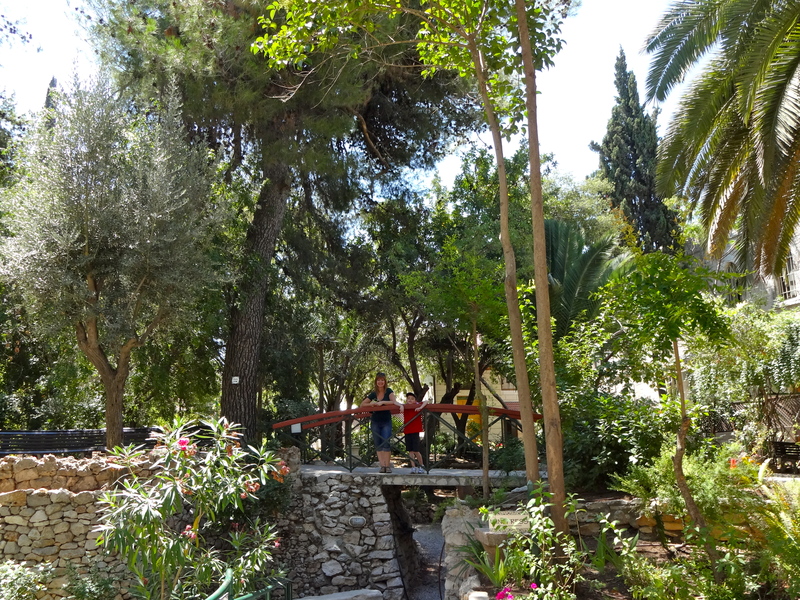 When it was over, he went with his disciples to the Garden of Gethsemane, located at the foot of the Mount of Olives. Jesus knew what was about to happen, and wanted time to pray. The Church of St. Peter in Gallicantu is built on the slope of Mt. Zion. 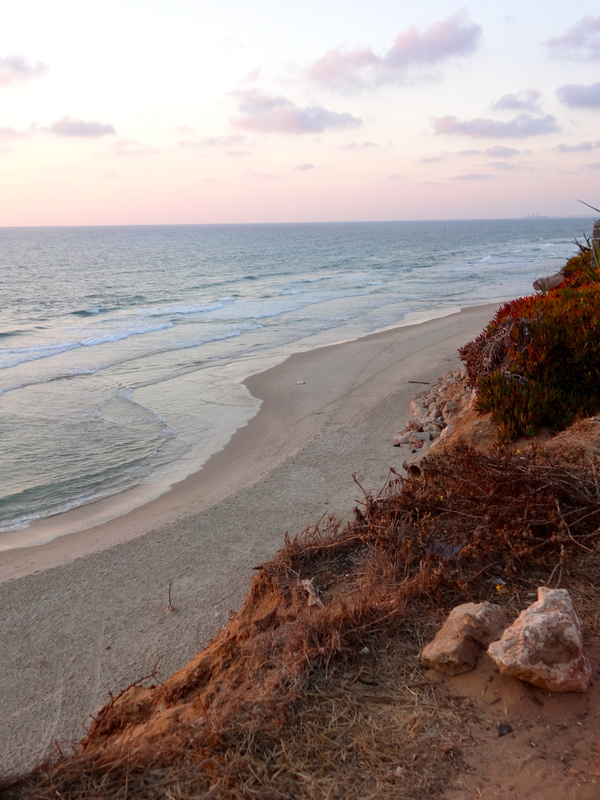 For centuries, this location was believed to be the site of the palace of the high priest Caiaphas. 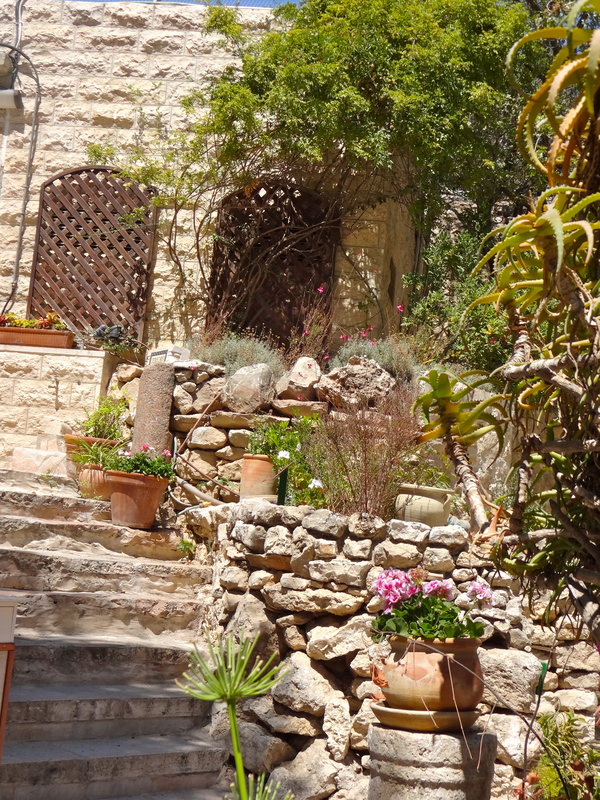 If it is indeed the site, this would be where Peter denied Jesus three times before the rooster crowed, as prophesied by Jesus. “Gallicantu” means “rooster crows” in Latin. 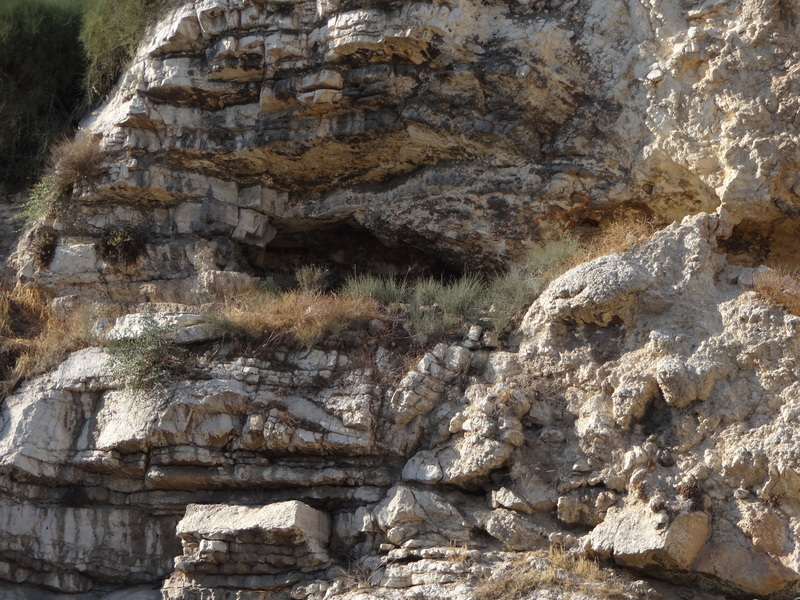 This is one of two sites that are identified as possible locations for the palace of Caiaphas. 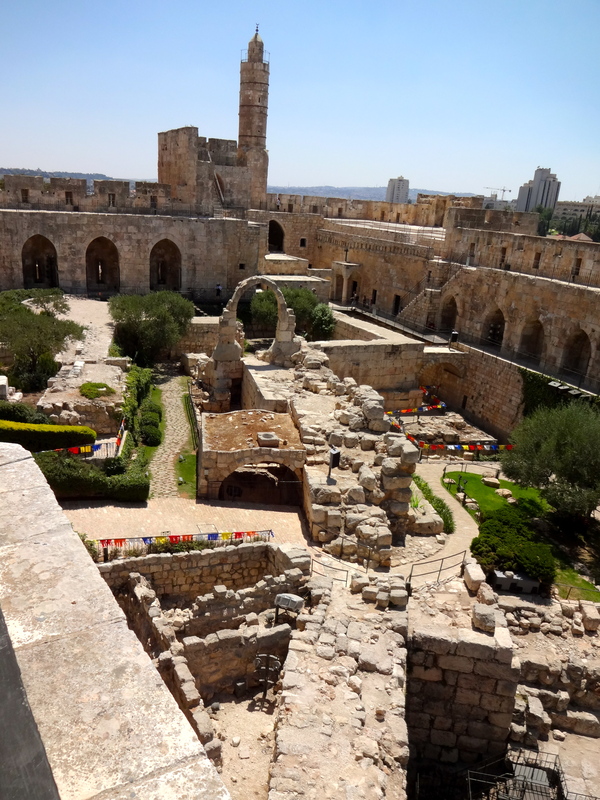 Recent excavation on this site uncovered large meeting rooms, which may have been where the Sanhedrin met. 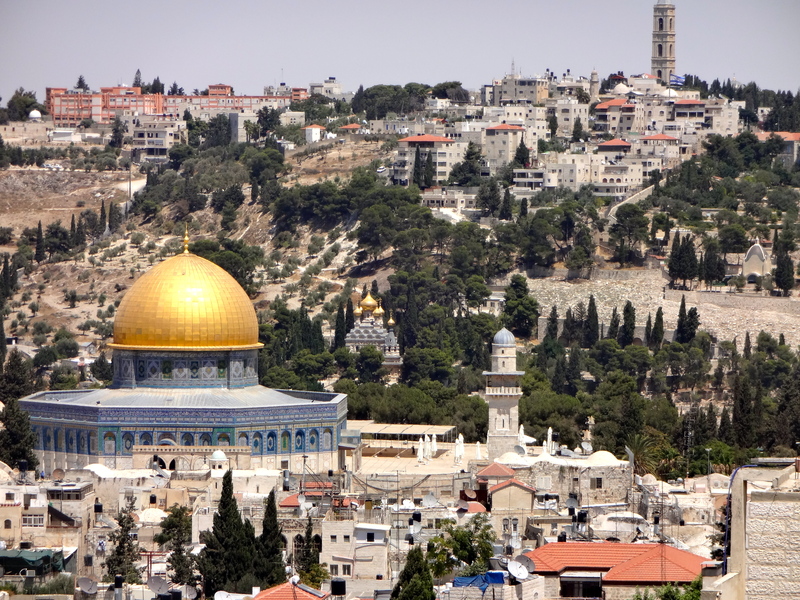 In the photo below you can see the Dome of the Rock, located on the Temple Mount. Whether or not this is the actual site, the location struck us because from it you can see the Passion of Jesus unfold. In the photo below you can see the walls of Jerusalem, inside which Jesus celebrated the Last Supper (Passover) with his disciples. Jesus then left Jerusalem from one of the gates with his disciples. 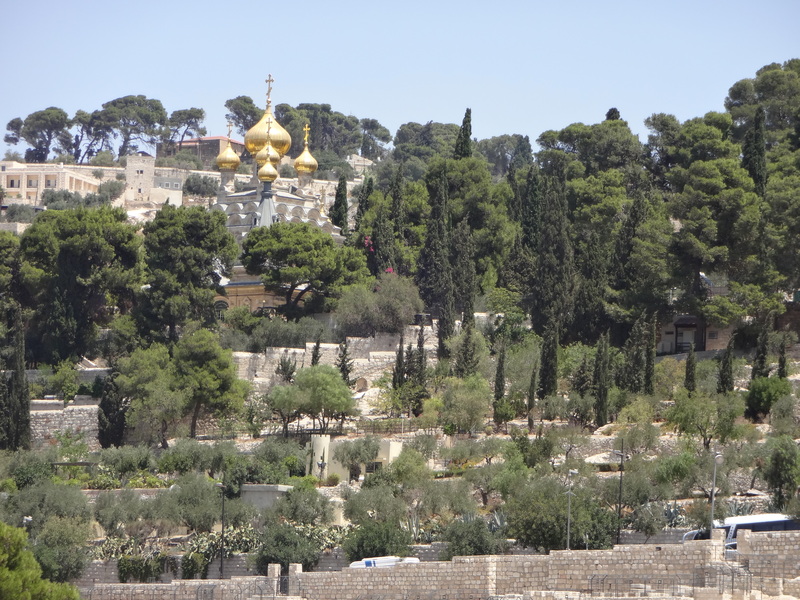 To the right of the walls you can see the Garden of Gethsemane on the Mount of Olives where Jesus went to pray, and where he was arrested. 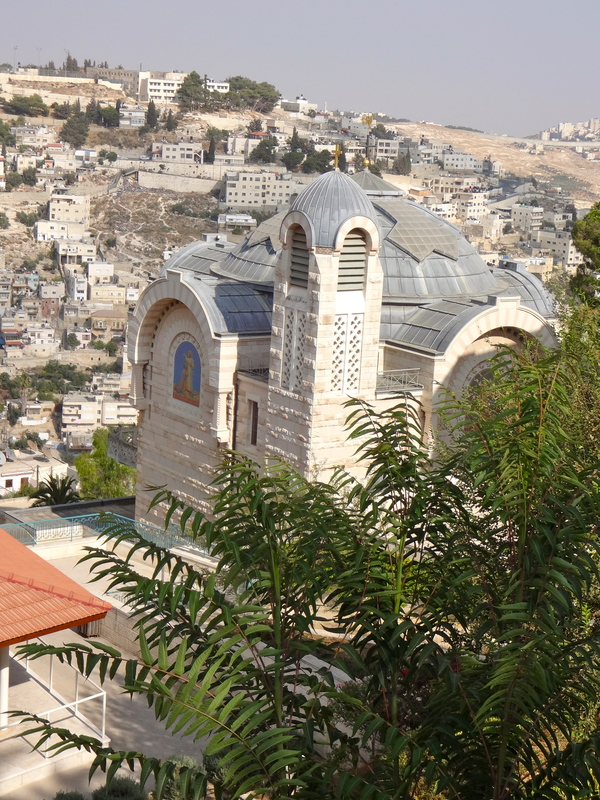 You can barely see the onion-domed church of St. Mary Magdelene, situated in the Garden of Gethsemane. After his arrest, Jesus was taken to the high priest and the Council for questioning at Caiaphas’ house. Below is a photo of the Church of St. Peter in Gallicantu. 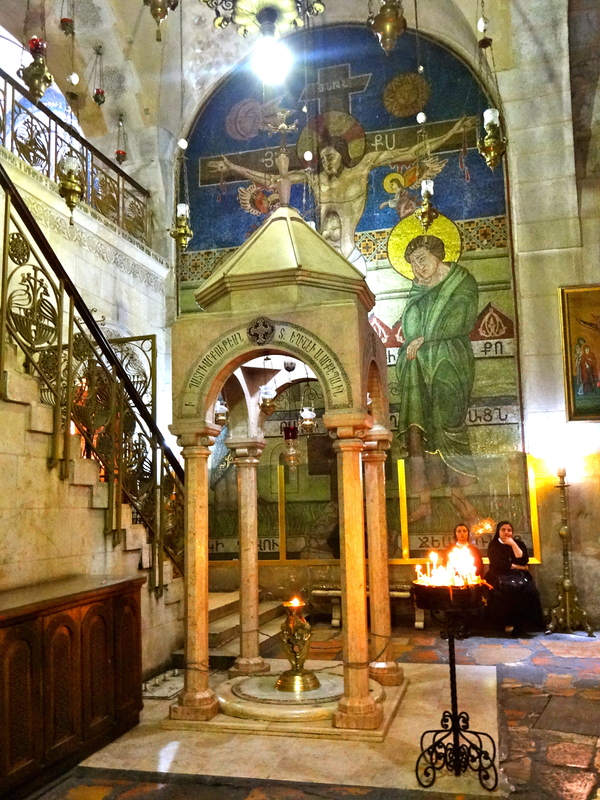 It is built over a dungeon, where some believe Jesus was imprisoned after he was beaten and mocked by the Council. After questioning Jesus, the high priest and the Council became furious with Jesus because he claimed to be the Messiah and quoted an Old Testament prophecy. Someone without biblical knowledge would not have caught the meaning of Jesus’ statement. Caiaphas and the Council, however, did not miss Jesus’ meaning. Jesus had quoted a prophecy from the book of Daniel, and in doing so, claimed to be God. Claiming equality with God was the height of blasphemy, a sin worthy of death. Herod’s Palace at Jerusalem was built in the the 1st century BC by Herod the Great, King of Judea. It was the second most important building in Jerusalem, after the Temple. Herod’s palace is also possibly where the wise men came after Jesus’ birth. Nothing remains of the palace today except for the Citadel, which has been destroyed and rebuilt over the centuries. The praertorium (governor’s residence) at the Palace was the official residence of the Roman governers when they came to Jerusalem. So, this is possibly very close to the site of Jesus’ trial by Pontius Pilate. Interestingly, after interviewing Jesus, Pontius Pilate wanted to release him. This is the most fascinating church I have ever seen. It is a strange mix of Byzantine, medieval, and crusader styles. 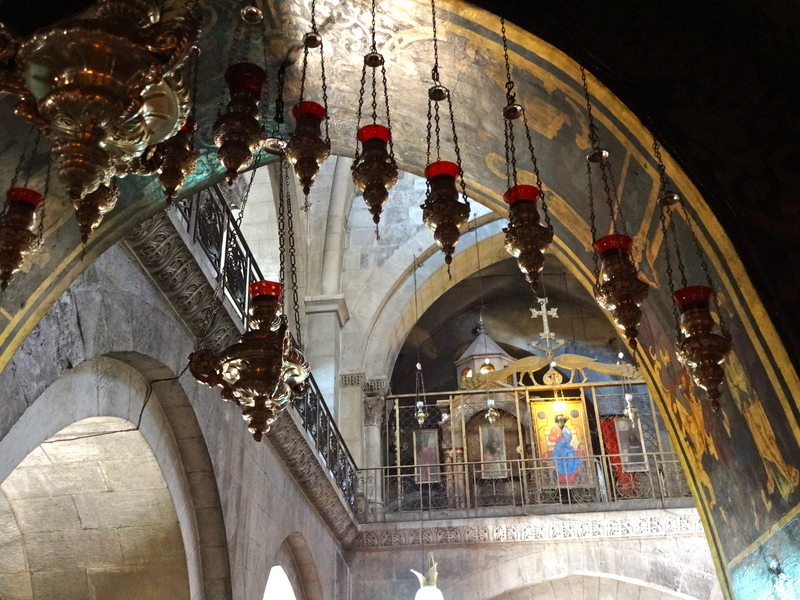 The first church was founded by Constantine the Great in 335, after he sent his mother, St. Helen, to find the site of Jesus’ crucifixion and burial. 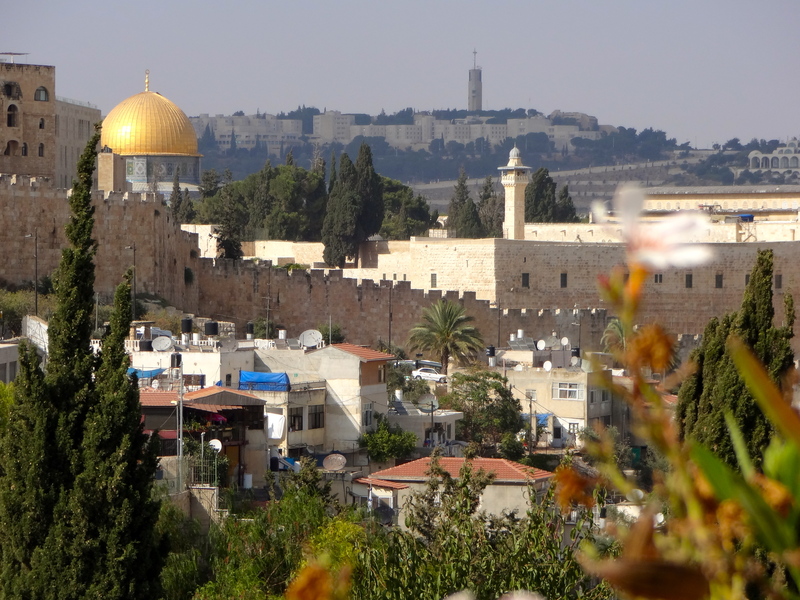 The early Christian community of Jerusalem was said to have met together at the tomb of Jesus until 66 AD, when the city was taken by the Romans. Emperor Hadrian filled in the quarry and built a temple to Aphrodite. Constantine removed the pagan temple. The rock-hewn tomb of Jesus was isolated and the church was built around what was believed to be the excavated hill of the Crucifixtion. According to contemporary Christian historians, the Rock of Golgotha was found during the excavation and building process. The most convincing piece of evidence that this might be the actual tomb of Jesus is that other first-century tombs are found inside the church. The burial shafts date to the time of Jesus’ death. This site LOOKS much more like the place of the Skull, as described in biblical accounts. This area was part of an ancient stone quarry. According to local oral tradition, the quarry was the site of execution by stoning (think about it…makes sense). So, it is possible that the Romans also used the site for crucifixions. Crucifixions usually took place next to busy roads, so that many would pass by and be deterred by the fate of the criminals or insurrectionists. It is ironic that now, in modern times, just below this site is a very busy bus station. I took the photo and cut out the bus site because I though it took away from the preciousness of the site…the place where Jesus died for the sins of all humanity. 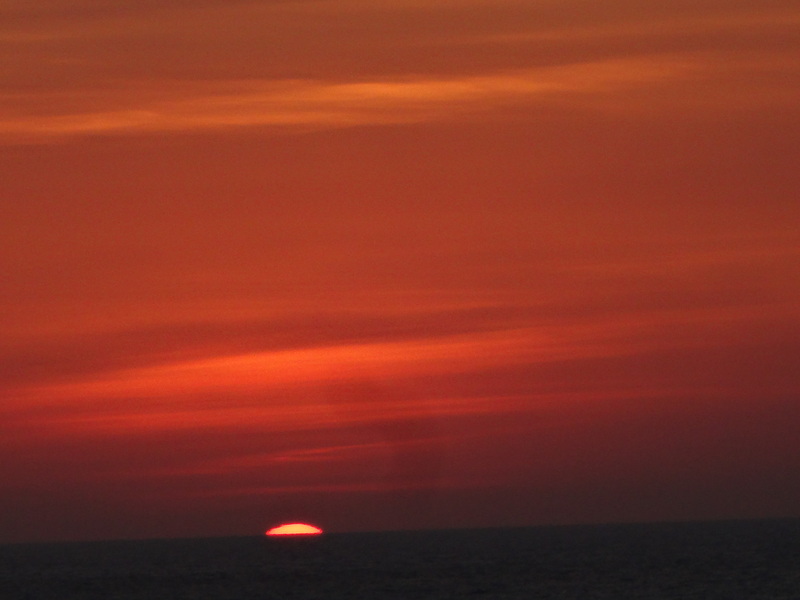 However, in retrospect, I think it’s God’s way to shout “I love you! !” to all the hundreds of people coming and going on the buses each day. I wonder if they hear Him? 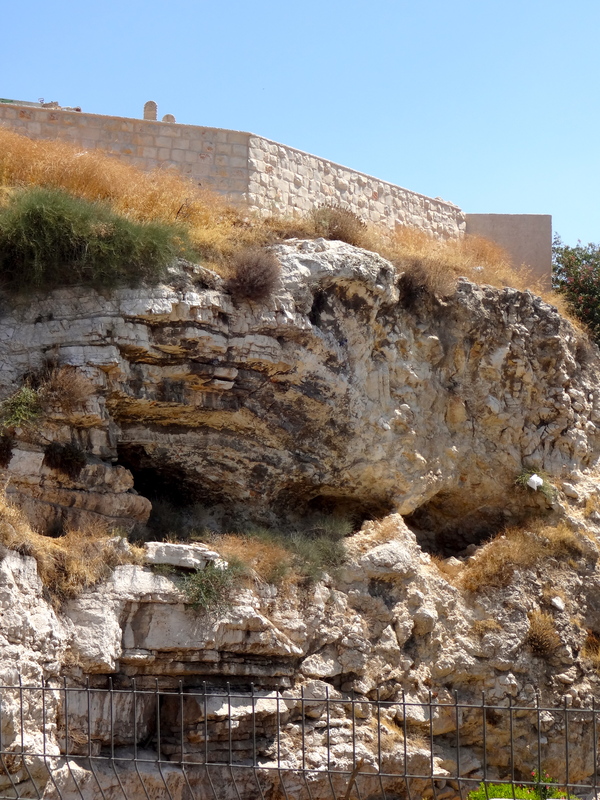 In scripture, the place where Jesus was crucified, and the place where he was buried were very close in proximity…as are Golgotha and the Garden Tomb. The garden area is really lovely and peaceful. 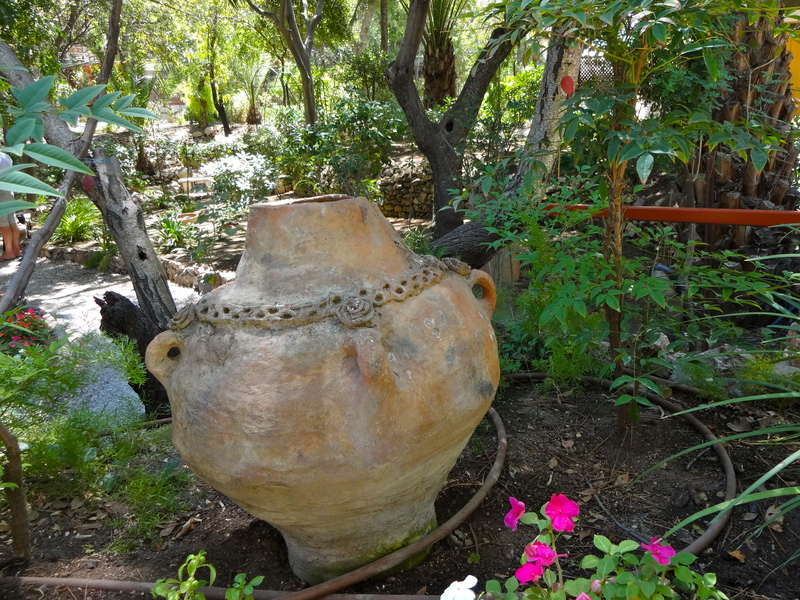 It has been tastefully landscaped to accommodate Christian groups who come to worship and give thanks at this site. We heard a group singing worship songs in another language, and we could recognize the tune without understanding the words. It was beautiful!! The tomb was excavated in 1867. 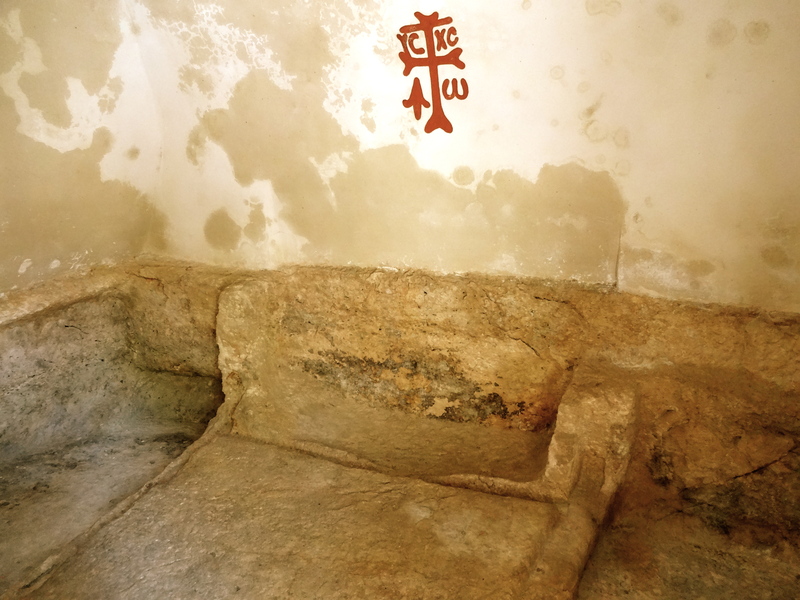 The exact dating of the tomb is disputed; however, it fits biblical description in that it is cut out of solid rock, and it was sealed by a rolling stone. You can see the channel for the stone behind Andy’s legs. The exact LOCATION of the place of Jesus’ crucifixion and resurrection isn’t as important as WHY he died, and WHO he died for. The Jews have been persecuted by ignorant Christians throughout the centuries since Jesus’ death for being “Christ killers”. Their reasoning is ridiculous, because Jesus was Jewish, as were the disciples and the early Christian church. The persecutors of the Jews didn’t get it…that Jesus’ death wasn’t a mistake…it was part of God’s plan to reach out to a lost world, to bring people back to a relationship with Him. In fact, Jesus predicted his own death. The Temple was destroyed by the Romans in 70 AD. 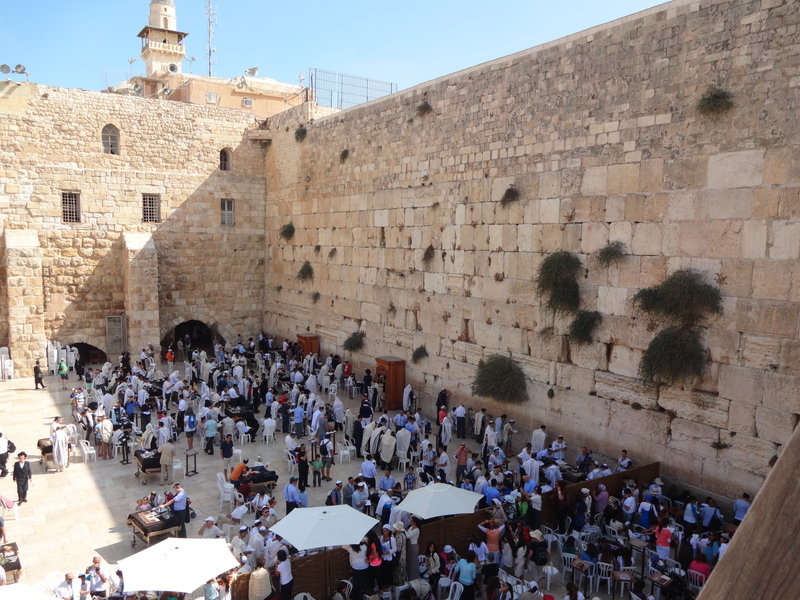 The Western Wall is a remnant of the ancient wall that surrounded the courtyard of the Temple. 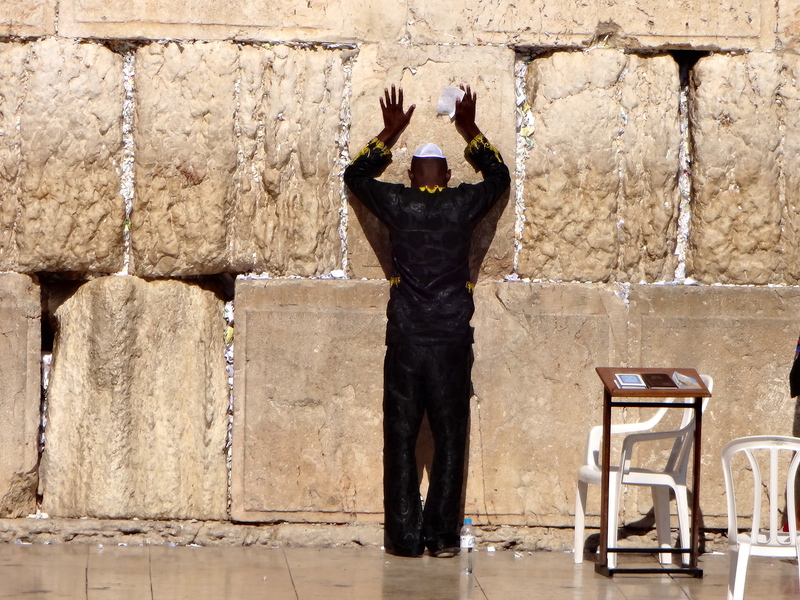 It is one of the most sacred sites for the Jewish faith. 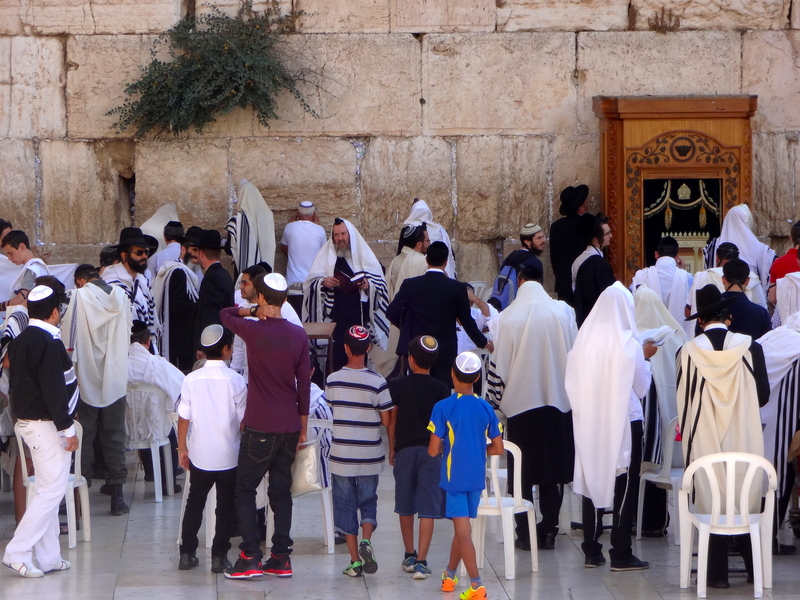 The Jews pray at the Western Wall because it is the side of the Temple Mount which is closest to the location of the Holy of Holies: the inner chamber where the ark of the covenant was kept. Jesus often taught at the Temple, as did his disciples, following Jesus’ resurrection. 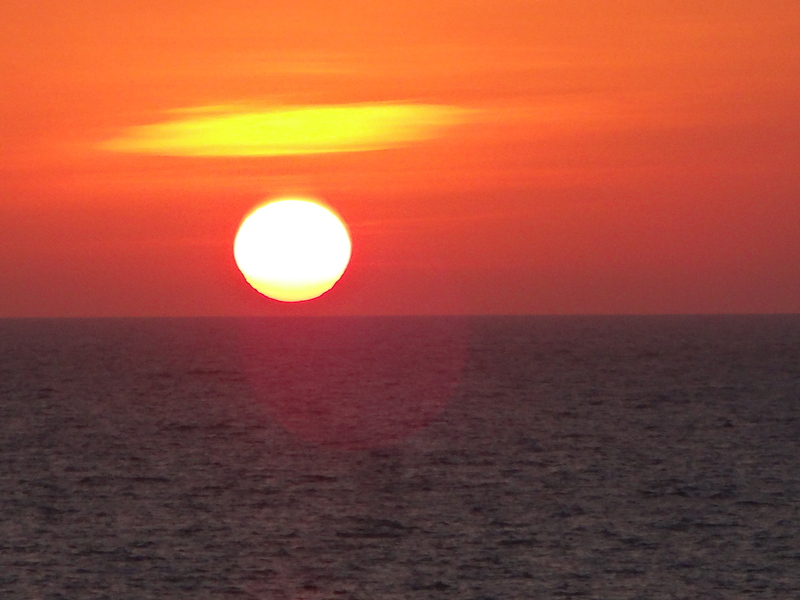 The controversy over Jesus’ claims to be God did not end with his death and resurrection. Peter and John healed a lame man begging for alms at the gate of the temple. This attracted a big crowd, so Peter began to boldly tell the crowd that it was the power of Jesus who healed the man, and how Jesus fulfilled Old Testament prophecies about the Messiah. Not surprisingly, this annoyed the Jewish leaders, who had Peter and John arrested. The next day they were brought before Caiaphas (a little deja-vu, perhaps?) Peter had the audacity to tell Caiaphas and the leaders that Jesus’ was the Christ! Many who are of other faiths or of no faith have respect for Jesus. Some believe that Jesus was a great teacher, but don’t believe he was God. They believe he was a great human being. Some even revere Jesus as a great prophet. C.S. Lewis argued against the view that Jesus was a great teacher in his book Mere Christianity. He argued that Jesus made astonishing claims about himself, such as having the authority to forgive sins and to be the only way for people to attain salvation. First, that Jesus’ claims were false and he knew it. That would make him a liar…ouch! If he knew his claims were false, then he was purposefully deceiving people. If that is the case, there goes the idea that Jesus was a great teacher. The second possibility, according to Lewis, is that if Jesus’ claims about himself were false, and he didn’t know it…then he was a lunatic! These days, if someone claims to be God himself, we lock him or her up in a loony bin! 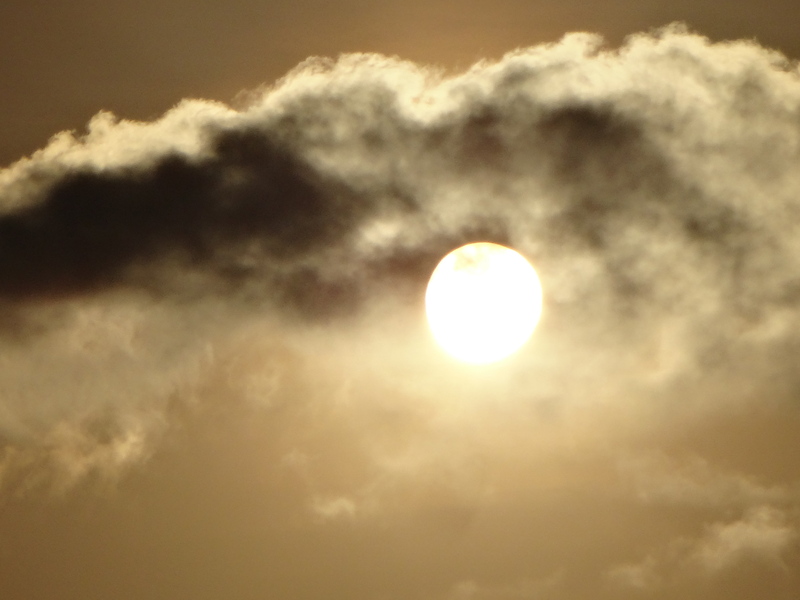 Everyone decides for themselves what they think about Jesus’ claims…liar, lunatic or Lord? 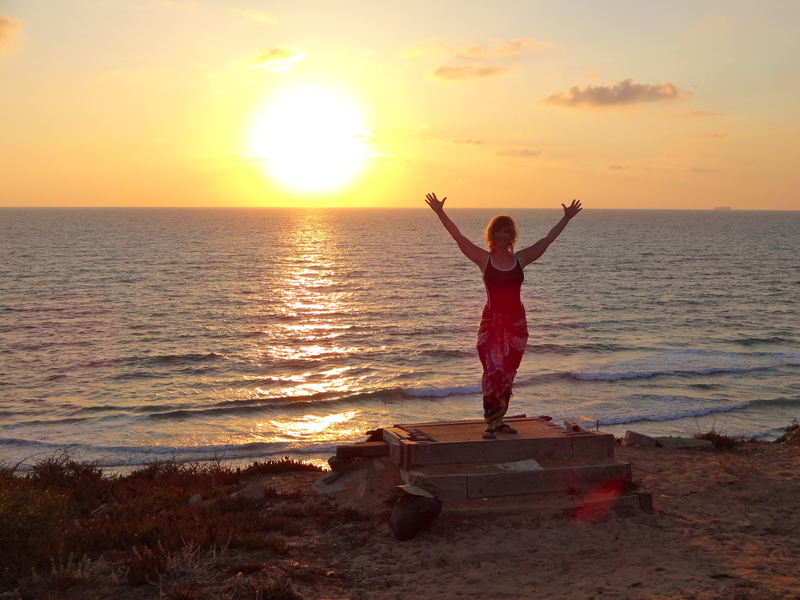 Sunset on the Holy Land! The end of our first day! We arrived in Israel with our friends and their family at 3:15am. I think Nate was the only one who got a semi decent night’s sleep. So we picked up our rental cars, drove to the home we are staying at, and crashed for several hours. 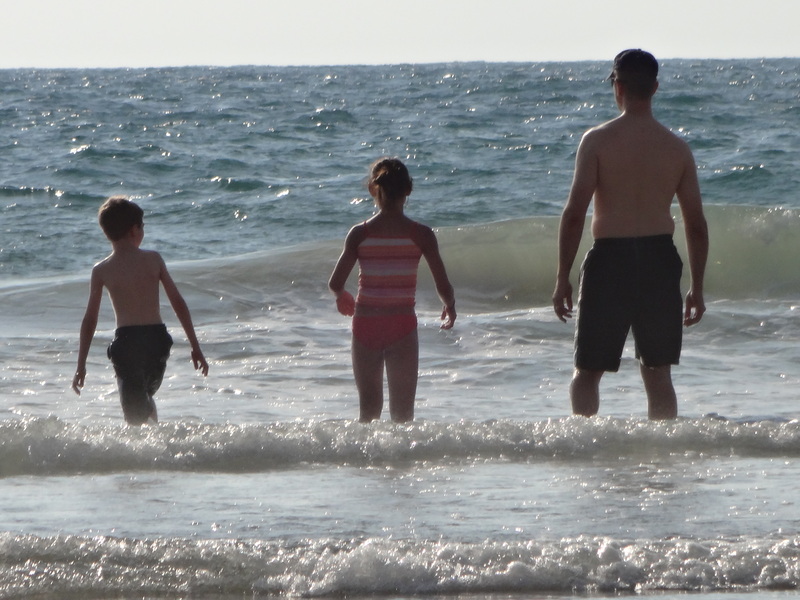 We woke up, had a late lunch, and headed off to the beach… just a five minute drive away. 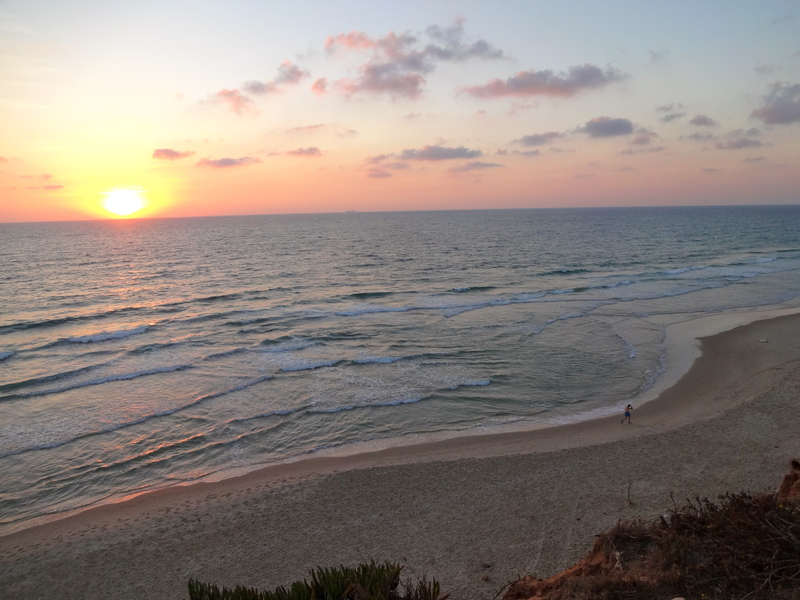 We were shown the way to this particular beach by the house sitter of the people whose home we are staying in. There was hardly anyone there! 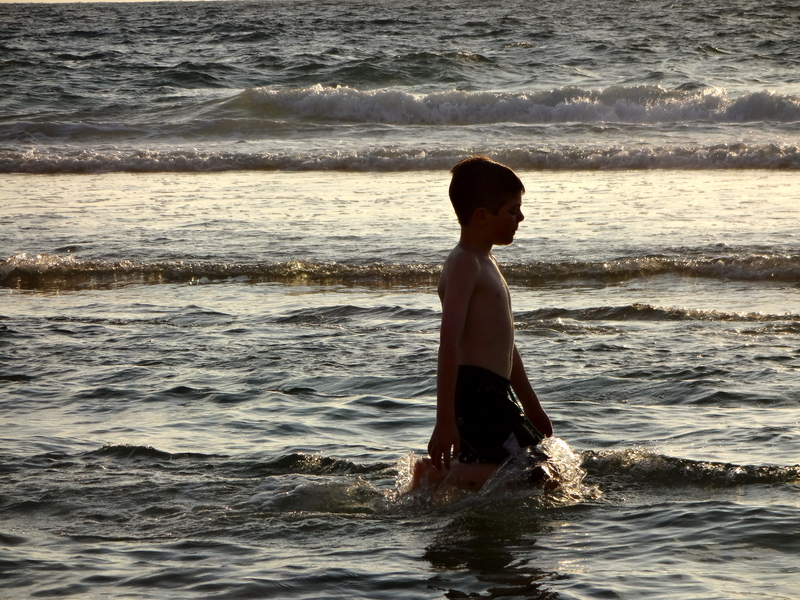 The water was about 75 degrees Farenheit! This kid LOVES the water! So does this BIG kid…he’s doing the Gangnam style dance out there! Bet you didn’t know that Andy can dance on water! 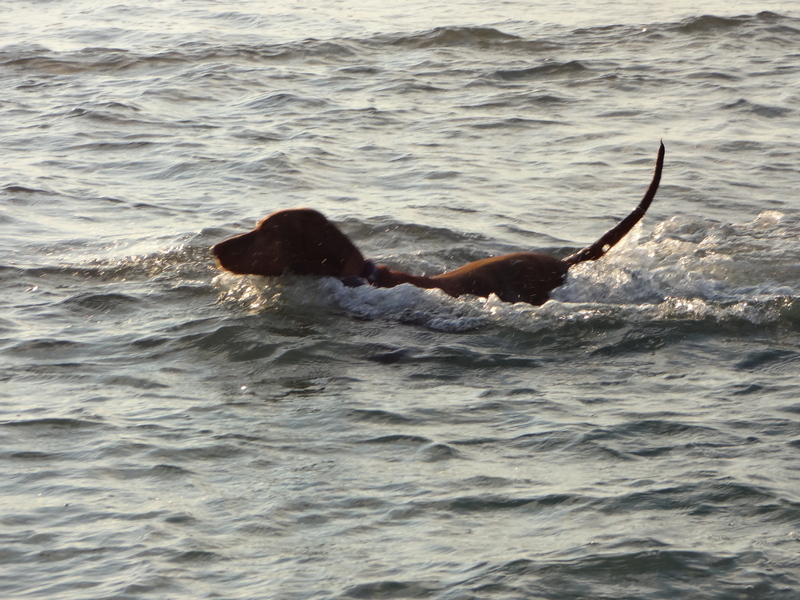 This pooch was thoroughly enjoying the water as well and swam with us the whole time we were there. 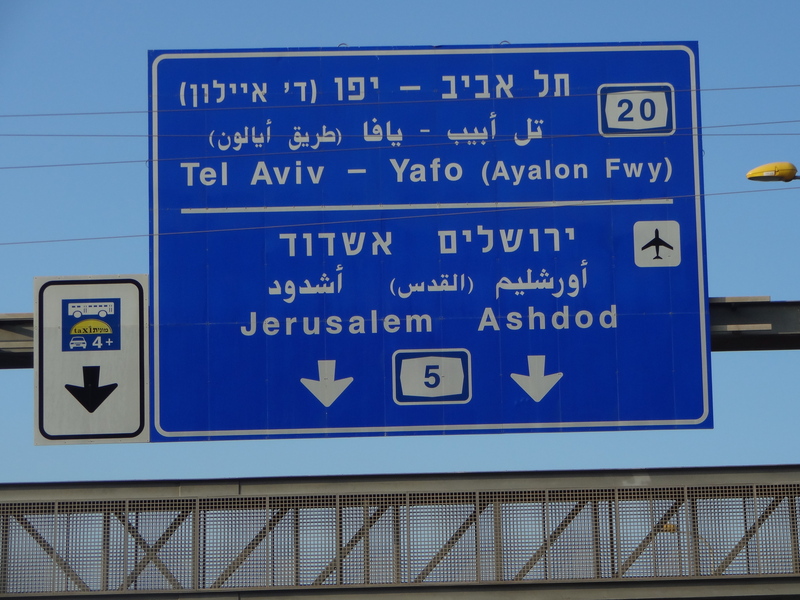 Praise God, we are in the Holy Land! 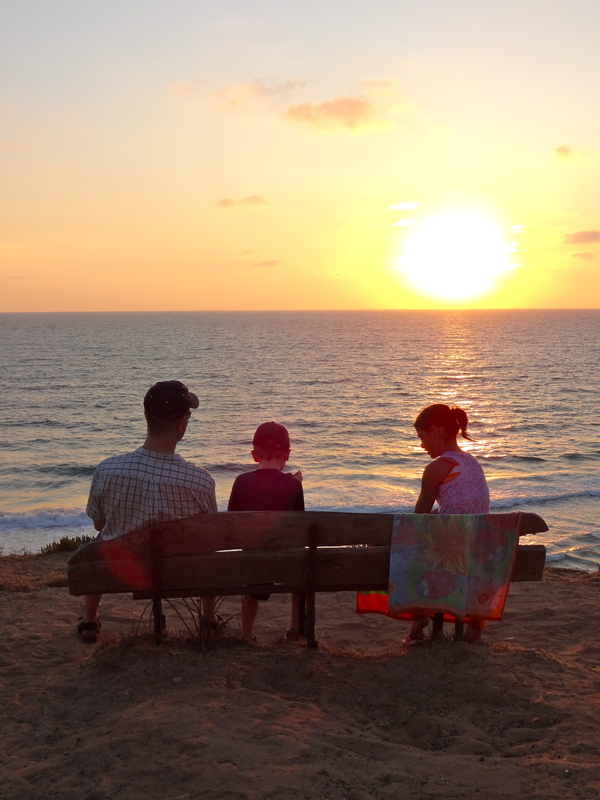 Then we watched the sun go down over the Mediterranean. It was a lovely secluded beach. 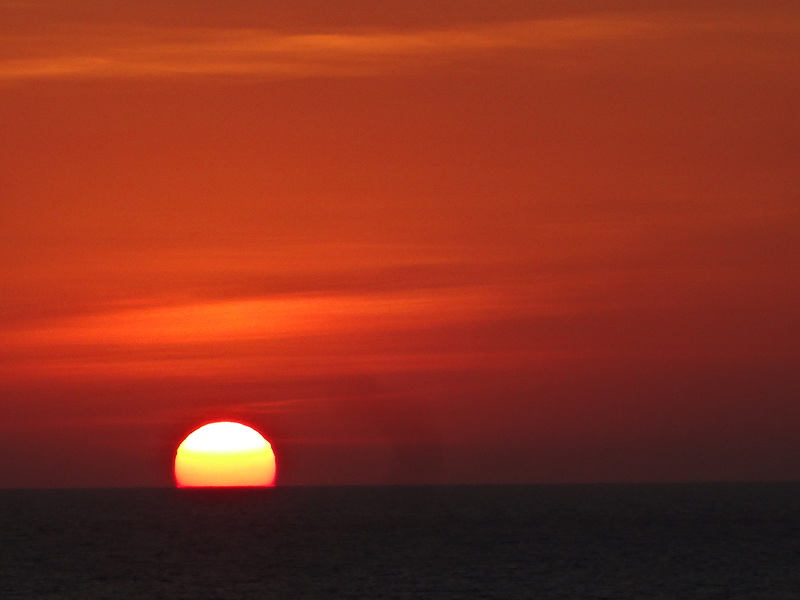 I think I must have touched the camera lense with a wet finger, because there’s a red circle on some of the photos, but they are still amazing shots to capture the lovely sunset. 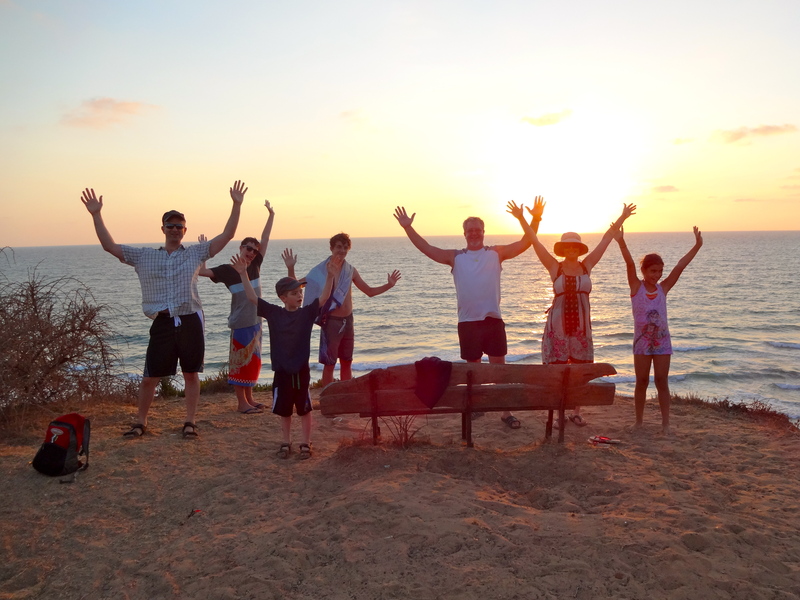 It was a wonderful end to our first day in the Holy Land! Many more great days have followed since then. 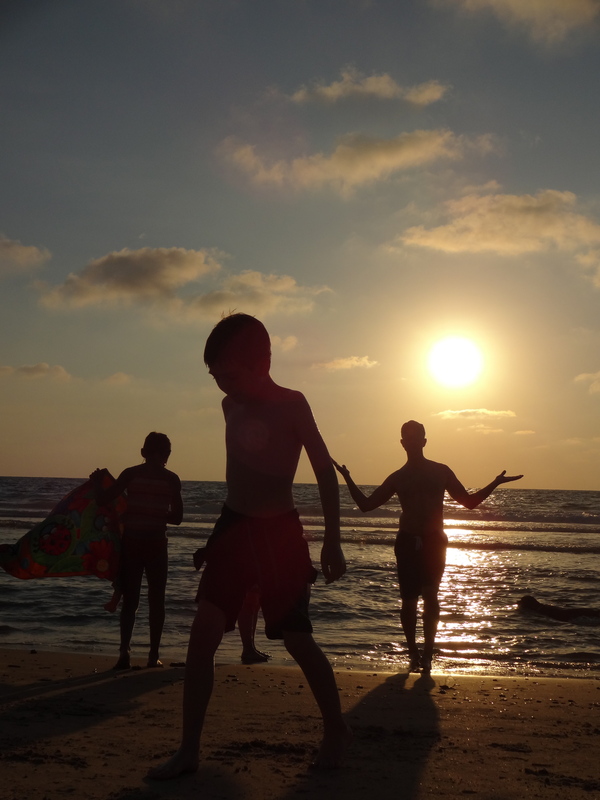 We’ve been to the Sea of Galilee, Nazareth, as well as three days in Jerusalem. 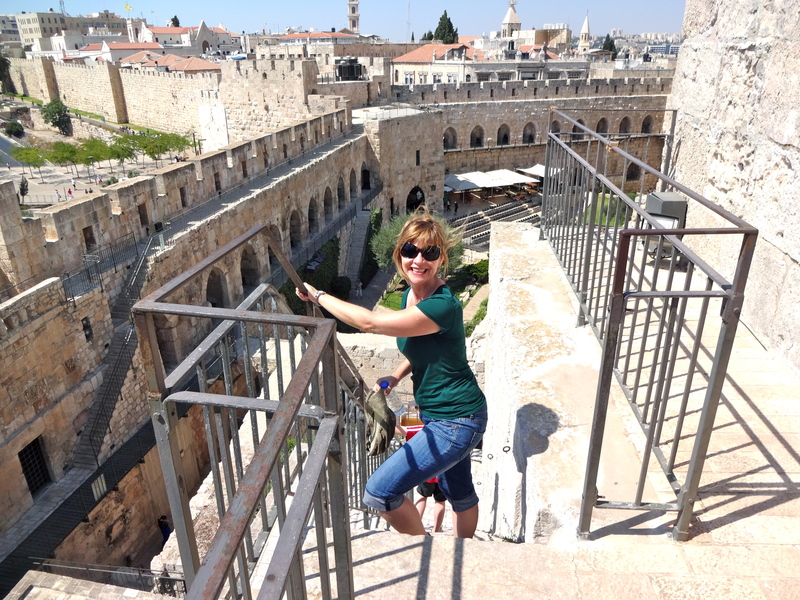 It’s amazing to see the city of David, to see where Jesus walked and taught, and to experience the sights and sounds of this fascinating country!